Off the beaten path by a long shot, Colorado's Unaweep Tabeguache Scenic Byway weaves its way through some of the wildest BLM lands in America. 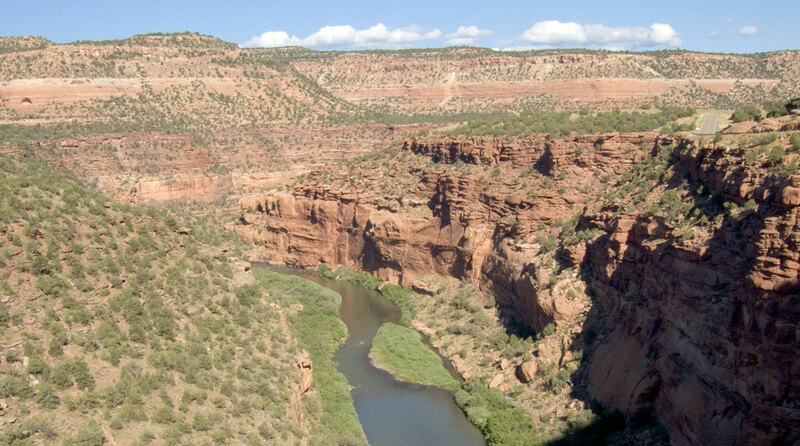 The Dolores River Canyon is an obvious highlight, with its smooth sandstone walls and roaring river. • Believe it or not, this section of highway played an integral role in World War II. The uranium used in the country's first atomic bombs was mined near Uravan, the midway point of the route. But there's more history here than just the A-bomb. Precambrian dinosaur and amphibian fossils have been found within the striated red sandstone canyon walls that surround the road. This area's soil has even produced rich copper reserves for entrepreneurial miners. 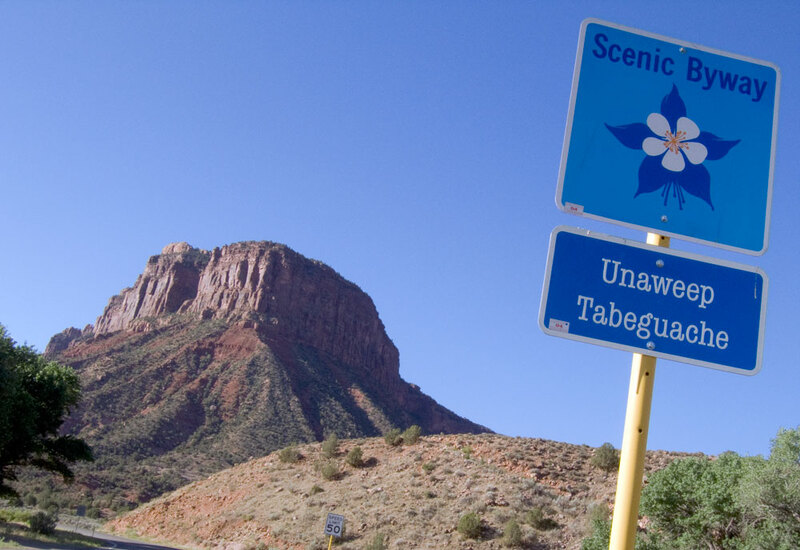 • Unaweep Tabeguache cuts through a canyon for most of the way, and follows the Dolores and San Miguel rivers. Through the years, these rivers slowly ate away at the soft sandstone creating the flattop canyon through which bikers ride. • The river also shaped industry in the area. The skeletal remains of Hanging Flume, an aqueduct system completed in 1891 to carry water for the mining process, can be seen clinging to the side of a sheer cliff. To view this 19th century ruin, stop at the overlook just outside Naturita. • Keep on the lookout for desert bighorn sheep near the town of Whitewater. Your best bet for spotting them is to look to rocky ledges and grassy knolls along the first few miles of the byway. 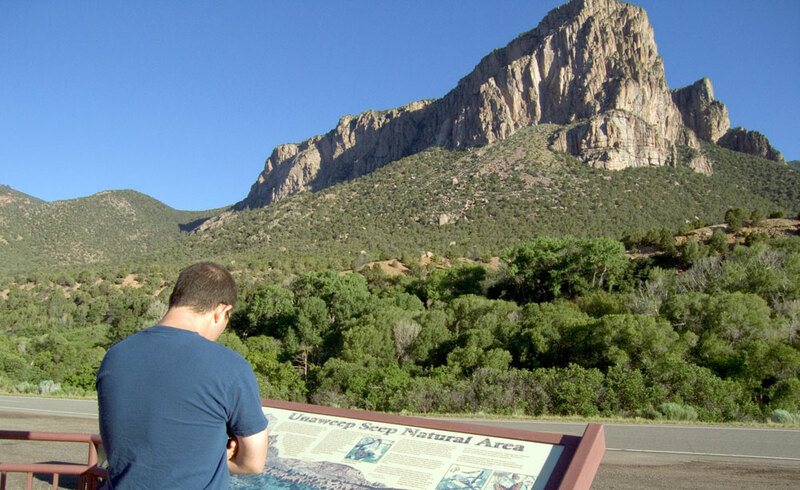 • Historical signage along the byway retells the journey of Dominguez and Escalante, two Spanish friars who traveled through the region in search of a passageway from the missions in New Mexico to those in California. The History: In the late 19th and early 20th century, copper and uranium mining reigned supreme here. One of the most poignant signs of this is the Hanging Flume, a dilapidated wooden trestle suspended over the canyon that delivered water to mining operations.